On January 6th, 2017 Shini, one of the developers at Arc System Works, replied to a Steam forum thread asking if the game would be returned to sale. “Will be up soon” is all that Shini said and later that day both Guilty Gear Isuka and Guilty Gear X2 #Reload were available to buy again on Steam. The publisher listing and header images were updated to reflect the change from KISS ltd to Arc System Works. Guilty Gear X2 #Reload (as well as Guilty Gear Isuka) was delisted on Steam on August 1st, 2016. A brief advanced notice was posted by publisher KISS ltd’s James Deputy on July 27th urging players to pick up the game before the August 1st deadline. According to Deputy the games were removed “due to the distribution rights reverting to the developer.” He added that the delisting is “hopefully temporary” but didn’t give any indication if KISS was seeking to renew the license with Arc System Works. 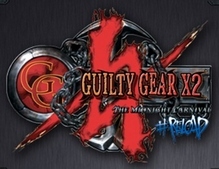 For the time being Guilty Gear X2 #Reload remains available as a download exclusively for the North American Xbox 360. “As humanity endeavored to better themselves, they created the biological marvel known as Gears. Originally intended as the next step of human evolution, they were instead fitted for war and turned against their own creators. A century later, you are left in the wake of the hundred year human-Gear war that nearly destroyed the Earth. Welcome to Guilty Gear X2 #Reload. 19 Unique & Bizarre Characters – An assassin who fights with their hair? A yo-yo-slinging bounty hunter? A corpse possessed by a sentient shadow? It wouldn’t be Guilty Gear without them! The varied designs and playstyles of #Reload’s sizable cast provide hours of entertainment… but if that isn’t enough for you, there may be even more fighters hidden away, waiting to be uncovered. 8 Gamemodes To Test Your Mettle – Play against a friend or the AI in Versus mode, fight to your dying breath in Survival mode, hone your skills in Training and Mission mode, show off your sick dust loop combos in Medal of Millionaires mode, or learn your character’s ultimate fate in Story mode; the choice is yours. Gorgeous Scenery, Ludicrous Design – Brawl in the rainy streets of London, atop a speeding airship, or even in the depths of Hell. The world of Guilty Gear comes to life through its art, and #Reload is livelier than ever before. Critically-acclaimed Soundtrack – Courtesy of Guilty Gear creator Daisuke Ishiwatari, the heavy rock musical stylings of #Reload are a force to be reckoned with. Buyers of Guilty Gear X2 #Reload on Steam will receive a digital copy of the Official Soundtrack for free!